We had one large blank wall in our living room that needed something special. 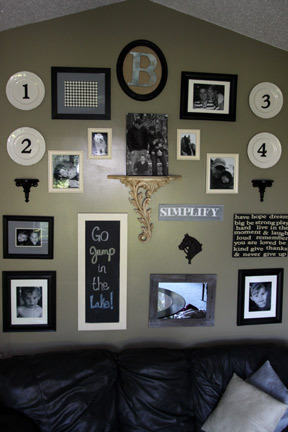 I came up with a gallery wall that tells the story of our family. 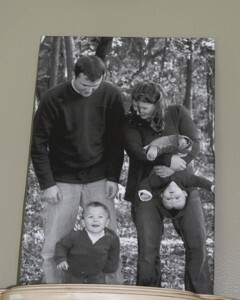 It is filled with things we love and our very favorite pictures! A great focal point and the first thing that you notice when you walk into our house. 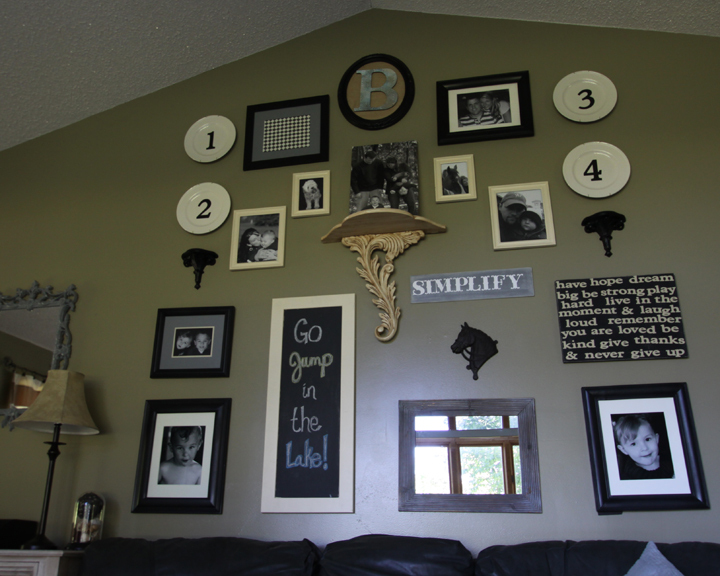 This wall was bare and needed something really special to fill it! When you enter our home there is no foyer, just the living room, which is open to the kitchen. 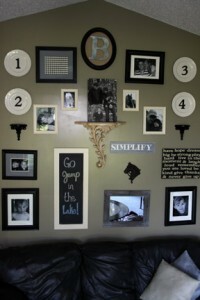 I didn’t want to spend a huge amount of money on giant wall art, so I searched for gallery walls for inspiration. I found that I liked a mixture of photos, pattern, a couple colors, and meaningful words. I got to work collecting mismatched frames that we had around the house to begin. I painted them all black and the smaller ones white. I also choose an accent color, a slate blue, to paint mattes, and other accents. I wanted everything to coordinate. 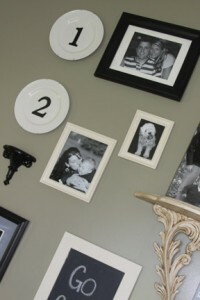 I mixed things that I had at home, with goodwill re-furbishes, and a canvas of our favorite family picture. 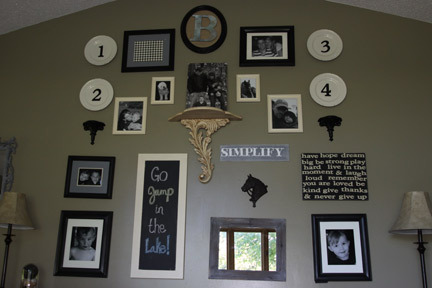 I already had the mirror, the horse, and the chalk board as well as all the picture frames. 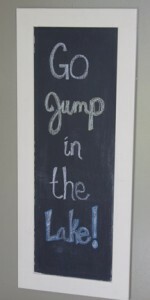 The chalkboard was a great gift that we received for our wedding. I painted the frame around it to match and I love the fact that I can change the message on the chalkboard to suit the season. I love the numerical trend so I bought 4 plates from the Dollar Tree and added black vinyl numbers to each that I cut out using a cricut machine. There is one plate for each family member! 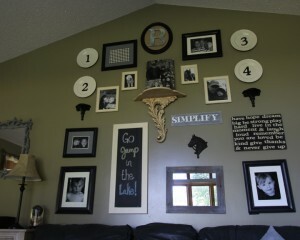 The small wall scone things are $ .50 good will finds that I repainted as well. 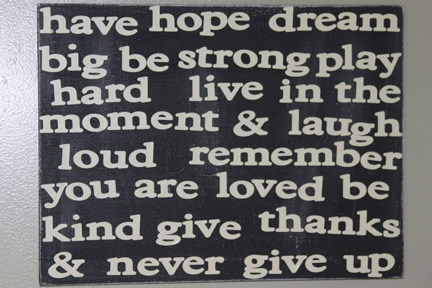 The inspirational words art is something I made from an ugly canvas painting I found at goodwill. I painted the canvas white, then black, distressed, and added words that I hope will inspire my family each day when they look at it! The monogram at the top was made from a mirror that I purchased at goodwill as well. I removed the mirror and put batting on the existing backing and covered that with burlap. 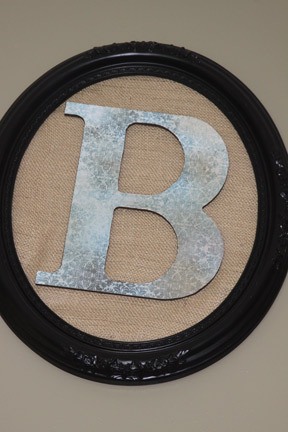 Then I modge podged a piece of scrapbook paper onto a wooden “B” that I found at Hobby Lobby. I painted the edges of the letter to finish it off and hot glued it onto the burlap. I laid everything out on the floor in our bedroom, and am sad to say, it stayed there for about three months. Not sure how my husband put up with walking around it for that long! But the longer I looked at it the more I knew what I wanted. Some things got added, and some removed from my original plan. It got rearranged more times than I can count. Sometimes by me, sometimes by the kids! In the end I am glad we took the time, and kept working on it until we really loved it! 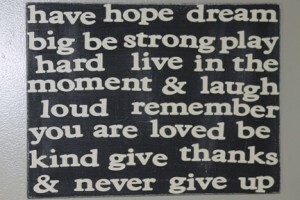 I love all of this!! You have such great ideas, I just love the stuff your mind comes up with. I will be checking back to see all the new things you come up with. 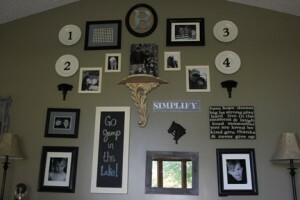 My favorite is still your kiddos bathroom and the bookshelves made out of gutters! We put them up in my little guys’s room, and I still think of you sometimes when I grab a book to read to him 🙂 Thanks for sharing and glad to see you enjoying all this life has to offer! Thank you so much Lori!! 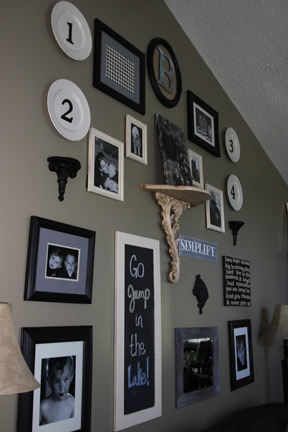 It makes me so happy to know that you put those shelves up in your little guys room! I can just see you all snuggled up with him reading his favorite books! Thanks for your sweet comments! It defiantly makes my heart happy to hear that you are enjoying the posts!